Sugino introduces a new, lower-priced version of their “Compact Plus” road crankset that offers a wide variety of gearing options not available from Shimano, SRAM, FSA, or Campagnolo. 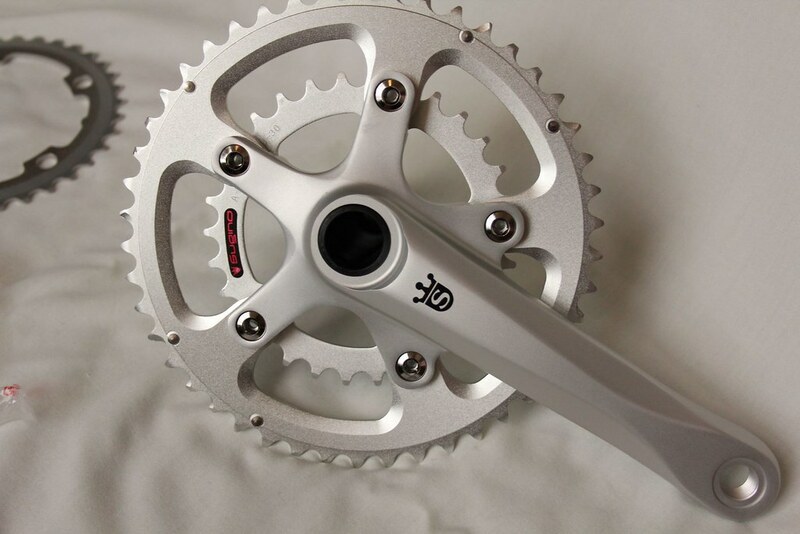 The Sugino cranksets are fully compatible with modern drivetrains. A few years I wrote about how the compact road double crank had eaten into the market share of the triple chainring road crankset, and ever since the market trend has followed my predictions. But I had my reservations to OEM manufacturers presenting compact cranks as the ideal solution for all riders. 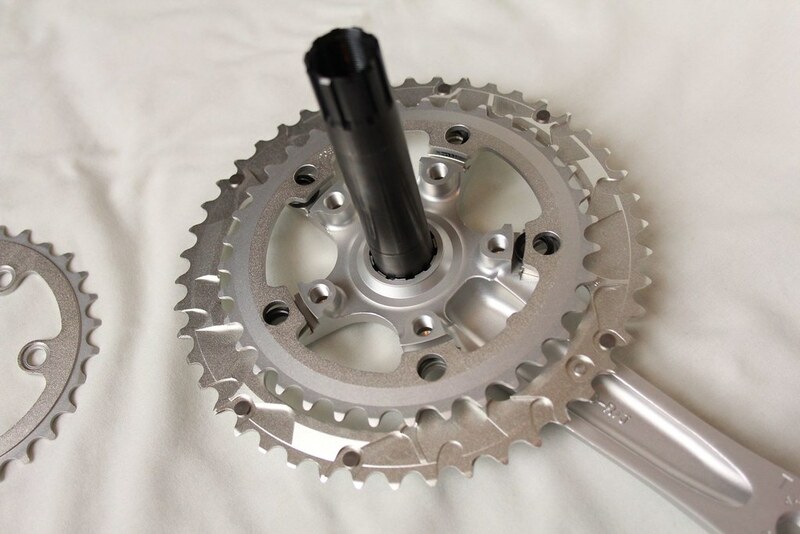 Sure, today’s 11-28t 10sp cassettes give a 50/34t crankset a very broad range of ratios, but a triple’s granny ring of 30T would give nearly a 1-to-1 option. Since then SRAM has been promoting their “WiFli” concept of combining a compact road crank with an 11-32T 10sp cassette, which seems to largely fulfill the roll of the sporting triple road crank. Still, it’s hard for me to see the point of a 50 x 11 gear (a serious 122 gear-inches) on a bike that isn’t meant for racing. With a cassette like that, I’d be spending almost all my time in the big ring but biased towards the larger cogs instead of comfortably in the middle of the casette. Sure modern shifting systems have made huge progress with shifting between chainrings under load, but I’d rather just leave it on one chainring position as much as possible. Perhaps if compact cranks had an option of a inner ring smaller than 34T, then maybe the 50T ring could be reduced as well to give a more balanced selection of gears for touring riders and casual riders who have no pretense of racing. 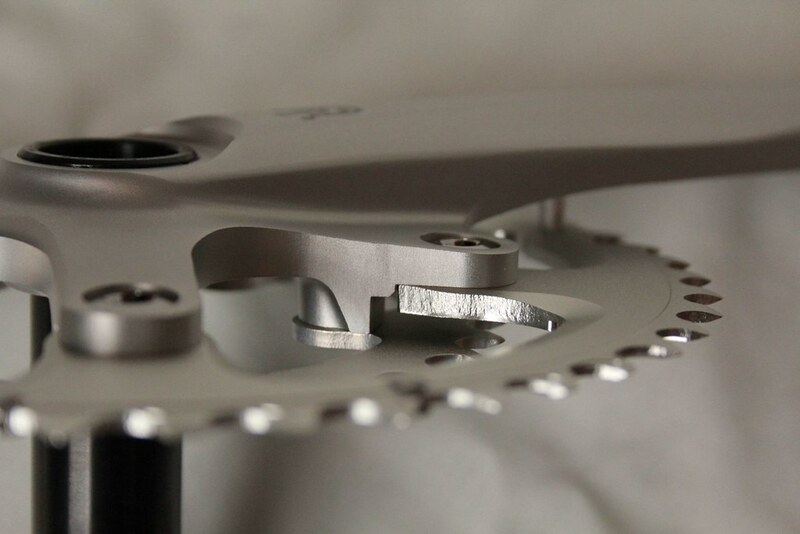 However, the 110mm bolt-circle-diameter of the compact crankset’s spider limits the inner ring to no less than 34 teeth,. That doesn’t stop component makers from reducing the big ring size, but neither is there much to gain by doing that alone. After all, it is the low-end of the gear range that begs to be expanded and better utilized. From a different angle, you have something of a renaissance of randonneur riders with their Francophile notions of wide range double cranksets. With the legendary TA Specialities Cycloctouriste and Stronglight 49D cranksets, their tiny bolt-circle-diameters allowed a very flexible range of chainring combinations, 46/30T being one of the favourites. Though a 46T big ring was largely inadequate for full-on racing speeds (especially with the typical 13 or 14T start 6sp freewheels of the time), it was well-suited to extended tempo riding characteristic of a randonnee. The 30T inner ring provided a suitable bail-out gear for climbing. However the old Cyclotouriste crankset and chainrings, developed decades before the intergrated shift/brake lever and prerequisite indexed front shifting, lack the ramps and pins upon which all modern shift systems depend. For a variety of reasons, this 46/30 combo never really found a home on bikes since those days before indexed shifting, integrated shift/brake levers, and the move to Asia-centered manufacturing. Working for a custom frame builder, I have seen a couple clients order up randonnee bikes incorporating high-end modern shifters with vintage-style cranksets. The resulting gestalt was a nightmare to tune to satisfaction. In a workstand, the front shifting would seem adequate, but under real world conditions, the chain could not be coaxed up onto the big chainring. The rider would have to completely ease off pressure and gingerly rotate the crank around until the chain had seated itself onto the big ring, completely negating all the benefits of having a shifter built into the brake lever. The one consolation is that with 10 cogs on the back, one wouldn’t have to shift the front too often, but disparity between front and rear shifting was glaring. Seeing a possible niche to explore, venerable Japanse component-maker Sugino introduced their OX801D crankset, featuring their so-called “Compact Plus” chainring arrangement. 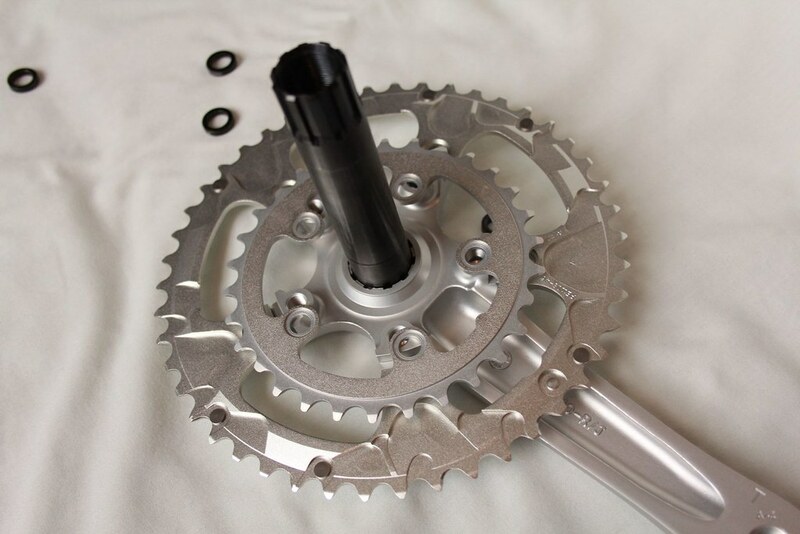 That is to say, Sugino made a crank that mounted the outer ring on a 110mm bcd, but the inner ring could mount on either a 110mm or 74mm bcd (the same bcd as the granny ring of a triple). To do this, the outer ring sits inboard of the spider, in a manner similar to the old Mavic model 631 “starfish” crank. For 110mm bcd inner rings, spacers separate the inner and outer rings while they are both engaged on the same extra long chainring bolts. If a 74mm bcd inner ring is chosen, then the outer ring is fixed to the spider with a set single-ring bolts, and the inner ring fits to its own set of mounting holes with bolts in a manner identical to a triple’s granny ring. Freed from the limits of the 110mm bcd, a 46/30T combination (as well as a variety of other choices from 26T-34T inner and 40-50T outer) were available, all with the desired shift pins and ramps. Even more, the OX801D employed an up-to-date external bearing bottom braket and 24mm spindle. However the OX801D suffered from two issues unrelated to its performance. First, it’s quite expensive, equal or greater to the price of a Dura Ace 7900 crankset. Hey, it’s a high-polished crankset cold forged in Japan, but even if it comes with BB bearing cups, that’s still a lot of coin. Secondly, and for reasons that were never fully explained to me, outside of Japan it was only available stock with a 50/34T combo. Now, the Sugino is a good crank, but the stock ring combo did nothing to set it apart from the ocean of competent market offerings. So here was an excellent idea that could potentially suit a broad range of serious if not strictly racing cyclists, but few of that demographic wanted to shell out that kind of money and then have to buy the chainrings they really wanted on top of that. Enter the new OX601D crankset, now imported by distributor Merry Sales. Eschewing the polished finish for a less costly bead-blast matte, the 601 comes with a BB but not rings. That way you can buy the ratios you really want without paying for stock chainrings first. Other than the finish, the two cranksets are identical as far as I have seen. Though the builder I work for has spec’ed the more expensive crank on a dozen or so custom bikes, I hadn’t had much actual riding experience myself with this “Compact Plus” crankset design until I installed an OX601D on my titanium bike a couple months ago. To be honest, I have a bad habit of starting a technical discourse and meaning to finish in succeeding entries, but then I never actually follow through. BUT not this time! Check back in one week for part 2, and I’ll give you my actual riding impressions. 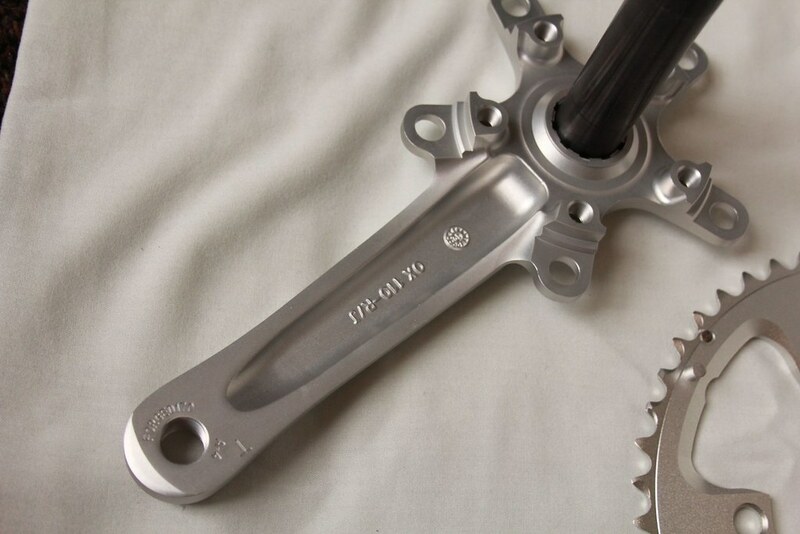 Above, the OX601D crank with a 74mm bcd inner ring. Next, the OX601D crank with a 110mm bcd inner ring. You can see the chainring spacers in the big flickr pix. The crank is relieved on the back to keep weight reasonable without sacrificing stiffness.